E. about to begin his painting--with no timidity or hesitation to create--just a bold desire to mix and twirl the colors. 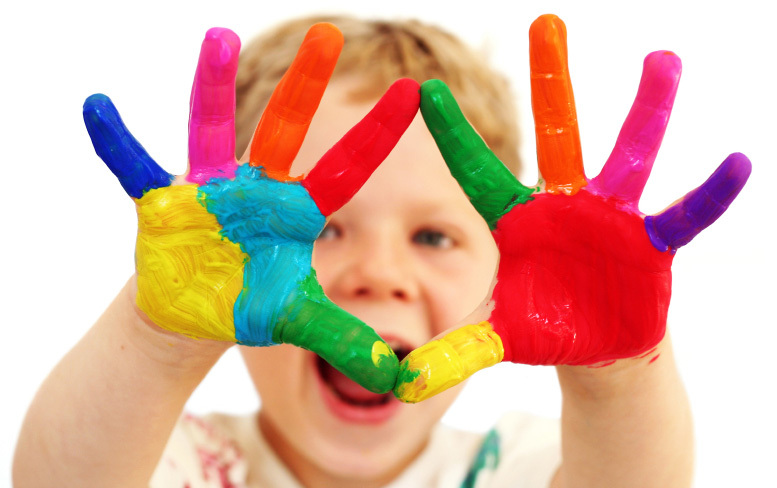 Pablo Picasso said, "All children are artists. The problem is how to remain an artist once they grow up." I have always thought that being creative helps us to feel more alive, more happy--whatever age. 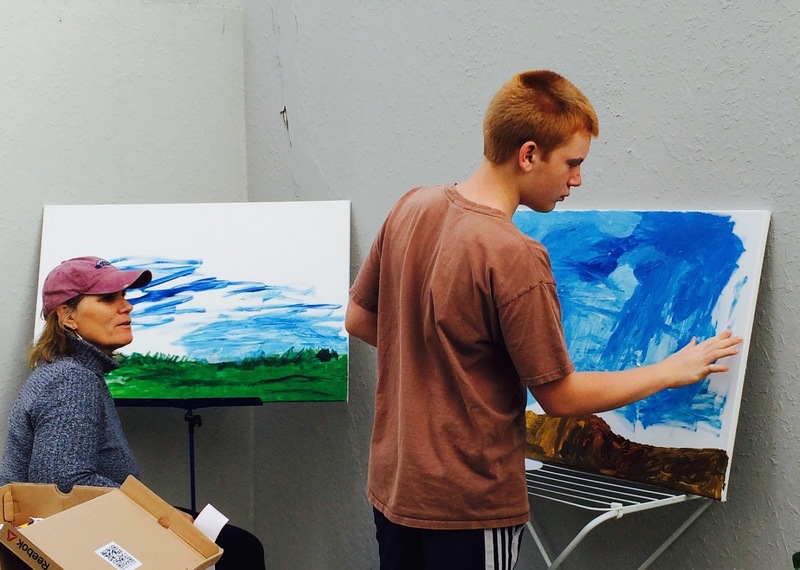 I am learning that art is a way to glimpse the beauty my boy with autism sees around him. Part of our home routine is now getting out the paint and clay. 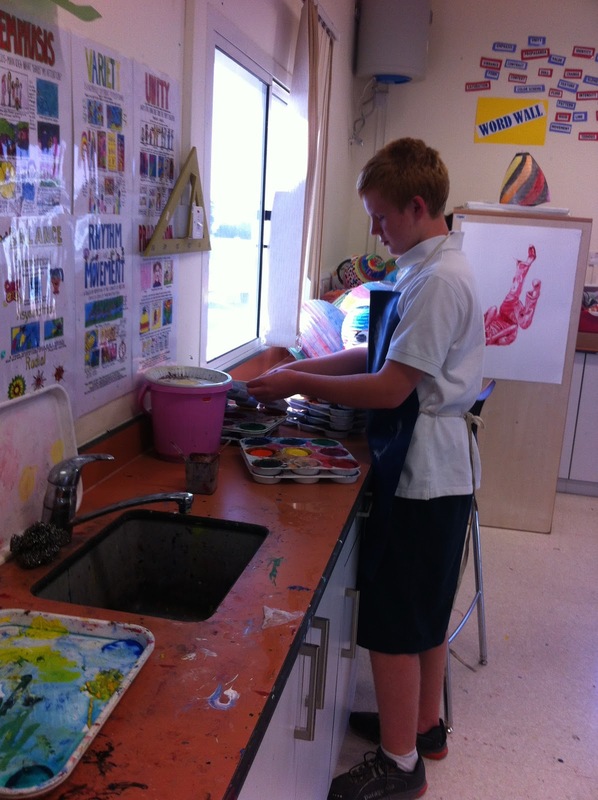 E. and his art teacher working together in an after school session. I guess I could also say 'Introducing our Jackson Pollack.' His teacher, Mr. Gabe, taught him to splash paint on a piece of paper, with cardboard in the background. Sometimes I scratch my head with bewilderment on how to engage my 13 year old son with autism--how to release those submerged emotions that sometimes erupt in unexpected, and yes, occasionally inappropriate ways. Although he is extremely verbal (sometimes his speech is repetitive and silly), I am deeply grateful for his ability to communicate, answer questions, and thus, move others with his simple, earnest thoughts. However, much of the routines of a typical child, like academics, play dates, extra curricular activities are all haltingly hard for him, and sometimes difficult for me to navigate. I would say that autism + adolescence = some swirling storms. Yet, even amidst the tempests, I feel blessed. In our autism journey together as a family (and it has required ALL of us), there have always been people who have appeared, almost magically, to come to our rescue when I desperately needed a clue on how to proceed. These relief workers even pop up in Qatar. When one moves across the world with a child with a disability, it is particularly poignant to find someone who is willing to enter into your child's world--to travel with you, even sporadically on this autism journey for awhile. The first time I met Mr. Gabe, E's middle school art teacher, I knew we were kindred spirits. Both of us have the same dream of teaching art in a barn someday (he is ahead of me because he already owns his barn). His current classroom is a delightful, colorful refuge from E's academic efforts--a place to create, discover, learn, and thus foster self-understanding for him. Although he teaches him two times during the school week, he offered to work with him one afternoon after school--just one-on-one. Preparing for a painting.... One of the things I like about doing art with E. is that he is free of any self-criticism; he believes he can be an artist any time he brings out the paint or clay. There are no reservations about the endless possibilities to create in his mind. Each time I go to pick him up, creativity seems to pour out of a hole in the roof-- to not only my son with autism, but to me. There is always some mellow jazz or inviting classical music floating in the air--settling any residual conflicts in him that occurred during the day. When I hear the rich, sonorous sounds of the music and watch him create, ideas distill on me also. I do not only desire to pick up a paint brush, but I am configuring how to duplicate a studio for both of us in my small patch of grass in Qatar. I want to see E's bold temerity in front of a canvas at home too--the same inquisitiveness, focus, and desire to create that I see in Mr. Gabe's classroom. William Carlos Williams's words from a poem comes to mind: "Catch an eyeful, catch an earful. and don't drop what you caught." His class stirs, motivates me to "catch" some creativity, to make something beautiful with my son. The experience of entering Mr. Gabe's classroom reminded me of a book that I utilized with my other five children called Doing Art Together: Discovering the joys of appreciating and creating art as taught at The Metropolitan Museum of Art's famous parent-child workshop By Muriel Silberstein-Storfer. I bought the book when my first child was a few months old in NYC as I carried her around The Met one day. I was envisioning many dreamy, but yet productive hours behind the easel with my children. And we did have many messy, creative times in the ensuing years. But somehow I forgot about that book when Elias came along with his autism. We have created with clay, paint, paper (actually, many times), but I now realize it was not nearly enough. Mr. Gabe has reminded me that I need to do more art with him--listening to him as he discovers himself on the canvas or paper. His comments intrigue me, as he fuses his own inner world with the paint and clay. This week as he patted the paint on the canvas to make autumn leaves, he said that the colors were "spicy--just like Indian food." 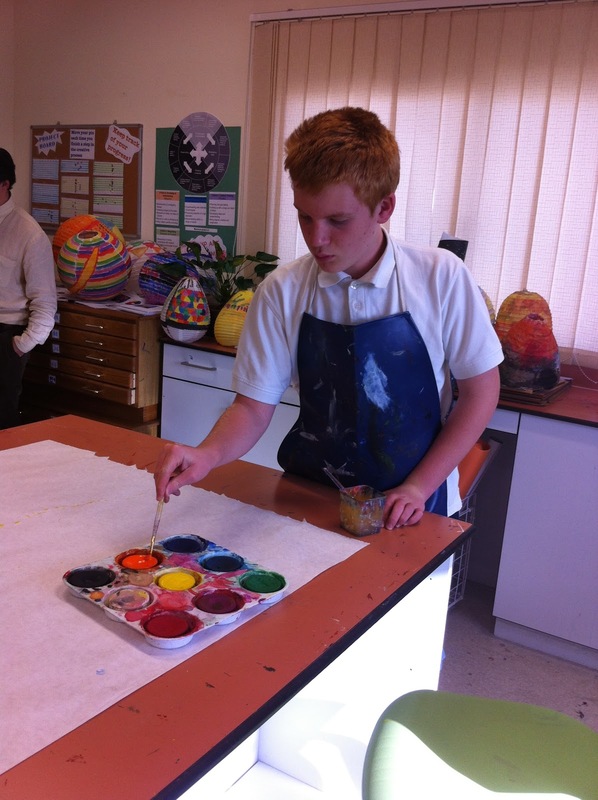 As we stirred the warm colors on the palette, I observed his joyful face--no self-judgment--just pure joy to create. These mediums, so unassuming and seemingly insignificant sitting on a shelf, are like a window for both of us to expand his world. As Dieter Uchdorf said in a talk on creativity, "The desire to create is one of the deepest yearnings of the human soul." So until I get my barn someday, I have made a little studio in our backyard in Qatar-- hoping that streams of creativity will pour down from the sky to us. You never know... maybe we really will open a gallery here in our compound. An Event of Rare Extraordinaire!